Has the Web changed Marketing Strategy? Yes, of course it has. Has it become a tool to help you organize your marketing efforts? You bet. The fact is, developing your brand and marketing materials has never been easier. Websites have become the proving ground for all aspects of a company’s marketing presence before it is ever committed to the sunk cost and expense of more traditional materials such as print, video and audio that, once created, cannot be easily changed or changed at all. Using your website as your marketing hub, you can develop and polish the look, the message and the content of your company and then use that to easily guide the development of everything from business cards to brochures to articles to online ads to billboards. Keeping your message and look consistent and on point has never been easier or more practical. In addition to developing your guide to marketing materials, the Web is also an excellent marketing research tool. Not only can you see which pages interest your visitors the most, but by promoting your website address in all of your marketing efforts you are inviting your audience to come visit your site. And, a portion of your audience will. By tracking your web traffic you can get a decent idea of the response rate of your advertising and campaign efforts. * New TV commercial? Track it. * Just attended a conference in Orlando and handed out over 250 business cards? Track it. * Just had a write-up in the local business journal? Track it! Comparing your traffic and the costs of each effort can give you a general idea of your Return On Investment (ROI). The results may surprise you! The proper and most efficient evolution of your business identity and marketing materials can save you money and make all of your efforts consistent, synergistic and more effective. (1) The first thing to establish is your logo. (2) From the logo a look can begin to evolve and be developed, along with your messaging and content in the form of a website. (3) It’s time to promote your company. Once finalized, these elements can be used to generate any marketing and support materials you need. If you are using the Web correctly, it has added a dynamic element to your marketing tool set that you will never give up. It has become the hub of all marketing efforts including conceptualization, message development, content development, public trials, visual treatment, general tracking and the source for nearly all marketing materials. 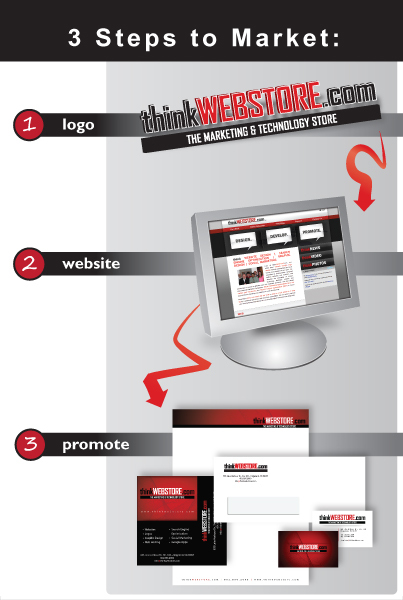 If you have questions or would like more information on how to maximize the use of your website and online presence in your overall marketing strategy, contact Think Webstore at (601) 856-2000.